This combination hormone medication is used to prevent pregnancy. It contains 2 hormones: drospirenone (a progestin) and ethinyl estradiol (an estrogen). It works mainly by preventing the release of an egg (ovulation) during your menstrual cycle. It also makes vaginal fluid thicker to help prevent sperm from reaching an egg (fertilization) and changes the lining of the uterus (womb) to prevent attachment of a fertilized egg. This product also contains a folate supplement (such as l-methylfolate, levomefolate). Folate is a B-vitamin that women of childbearing age use to help prevent spinal cord birth defects in an unborn baby. The folate supplement in this medication, along with a diet rich in folate, lowers this risk if you become pregnant while taking this drug or soon after you stop taking it. This medication also may be used to treat premenstrual dysphoric disorder (PMDD) or moderate acne if you have chosen to use birth control pills as your method of pregnancy prevention. Besides preventing pregnancy, birth control pills may make your periods more regular, and may decrease blood loss, painful periods, and the risk of ovarian cysts. Read the Patient Information Leaflet provided by your pharmacist before you start taking this product and each time you get a refill. The leaflet contains very important information on when to take your pills and what to do if you miss a dose. If you have any questions, ask your doctor or pharmacist. 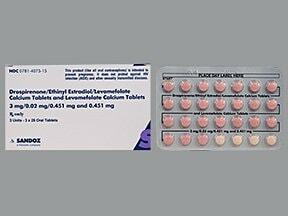 Your pill pack contains 24 pills with active medication (hormones and folate). It also contains 4 reminder pills (without hormones, but with folate) at the end of the pack. 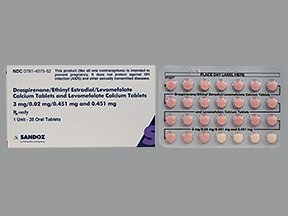 Take one active pill (with hormones) once daily for 24 days in a row. After you have taken the last active pill, take one reminder pill (without hormones) once daily for 4 days in a row unless otherwise directed by your doctor. You should have your period usually within 3 days after you take the last active tablet in the cycle. After you have taken the last reminder tablet in the pack, start a new pack the next day even if your period is continuing or if you do not have your period. If you do not get your period, consult your doctor. What conditions does DROSPIRENONE-ETH ESTRA-LEVOMEF treat? Nausea, vomiting, headache, abdominal cramps/bloating, breast tenderness, swelling of the ankles/feet (retaining fluid), or weight change may occur. Vaginal bleeding between periods (spotting) or missed/irregular periods may occur, especially during the first few months of use. If any of these effects persist or worsen, tell your doctor or pharmacist promptly. If you miss 2 periods in a row (or 1 period if the pill has not been used properly), contact your doctor for a pregnancy test. Tell your doctor right away if you have any serious side effects, including: a lump in your breast, mental/mood changes (such as new/worsening depression), unusual changes in vaginal bleeding (such as continuous spotting, sudden heavy bleeding), symptoms of a high level of potassium in the blood (such as muscle weakness, slow/irregular heartbeat), severe stomach/abdominal pain, yellowing eyes/skin, dark urine. This medication may rarely cause serious (sometimes fatal) problems from blood clots (such as deep vein thrombosis, heart attack, pulmonary embolism, stroke). Get medical help right away if you have: shortness of breath/rapid breathing, chest/jaw/left arm pain, unusual sweating, confusion, sudden dizziness/fainting, pain/swelling/warmth in the groin/calf, sudden/severe headaches, slurred speech, weakness on one side of the body, sudden vision changes. List DROSPIRENONE-ETH ESTRA-LEVOMEF side effects by likelihood and severity. Before taking this medication, tell your doctor or pharmacist if you are allergic to drospirenone, ethinyl estradiol, or folate supplements; or to any estrogens (such as mestranol) or any progestins (such as norethindrone, desogestrel); or if you have any other allergies. This product may contain inactive ingredients, which can cause allergic reactions or other problems. Talk to your pharmacist for more details. Before using this product, tell your doctor or pharmacist your medical history, especially of: adrenal gland problems, blood clots (for example, in the legs, eyes, lungs), blood clotting disorders (such as protein C or protein S deficiency), high blood pressure, abnormal breast exam, cancer (especially endometrial or breast cancer), high cholesterol or triglyceride (blood fat) levels, depression, diabetes, family medical history (especially angioedema), gallbladder problems, severe headaches/migraines, heart problems (such as heart valve disease, irregular heartbeat, previous heart attack), history of yellowing eyes/skin (jaundice) during pregnancy or while using hormonal birth control (such as pills, patch), kidney disease, liver disease, stroke, swelling (edema), thyroid problems, unexplained vaginal bleeding, obesity. If you have diabetes, this medication may make it harder to control your blood sugar levels. Check your blood sugar levels regularly as directed and share the results with your doctor. Tell your doctor right away if you have symptoms of high blood sugar such as increased thirst/urination. Your doctor may need to adjust your diabetes medication, exercise program, or diet. Tell your doctor if you just had or will be having surgery or if you will be confined to a bed or chair for a long time (such as on a long plane flight). These conditions increase your risk of getting blood clots, especially if you are using hormonal birth control. You may need to stop this medication for a time or take special precautions. What should I know regarding pregnancy, nursing and administering DROSPIRENONE-ETH ESTRA-LEVOMEF to children or the elderly? Some products that may interact with this drug include: aromatase inhibitors (such as anastrozole, exemestane, letrozole), boceprevir, ospemifene, tamoxifen, tranexamic acid, certain combination products used to treat chronic hepatitis C (ombitasvir/paritaprevir/ritonavir with or without dasabuvir). Does DROSPIRENONE-ETH ESTRA-LEVOMEF interact with other medications? Should I avoid certain foods while taking DROSPIRENONE-ETH ESTRA-LEVOMEF? Keep all regular medical and laboratory appointments. You should have regular complete physical exams which include laboratory and medical tests (such as potassium blood level, blood pressure, breast exam, pelvic exam, Pap smear) to monitor your progress and check for side effects. Follow your doctor's instructions for examining your breasts, and report any lumps right away. Consult your doctor for more details. This medicine is a multi-color (2), round, film-coated, tablet imprinted with "Logo and Z+ or M+". Are you taking DROSPIRENONE-ETH ESTRA-LEVOMEF? Are you considering switching to DROSPIRENONE-ETH ESTRA-LEVOMEF? How long have you been taking DROSPIRENONE-ETH ESTRA-LEVOMEF?